Making his Captaincy debut, Charlie takes us through his Team’s Round I Results from this week! The Summer League Round I shone upon us on 26th June. With temperatures at highs of 28 degrees, there was a warm air of certainty around the Labour Club, and after such an inspirational weekend of drinking, frolics, quiz games, and lazy afternoons with the Espion Dutch Crowd, it was hard not to feel like you were on your Summer break! “A working holiday” GM Keith Arkell responded to me, as he gleefully shook the hand of a wide-eyed and big-smiling 6 year old fan who offered him a game of chess. What a week we have had! Thank you again John for driving on and pushing through a great weekend [writeup to follow next week!]. It has been an absolute pleasure to join Hammersmith Chess Club, and what an honour to be asked to lead the Hammer Heads into the abyss that is the Summer League 2018. To the team then! I was lucky enough to have my first team selection made up of Brexit, Clueless, and “the Suit“, with myself making up the team on Board 4. I couldn’t have asked for an easier start to this captaincy business. I didn’t get to see much of the game on Board 1, but attach the game below for you all to peruse. Jeremy was in a bad position early on against a really exciting line (IMO!) by Black. But through grit, determination and of course a bit of help, Jeremy pulled through and delivered the first win for the team. 1-0 up, and on to Board 2, where Clueless seemed lost! But then I realised he often pulls that face to lull his opponent into a false sense of security. So with a presented opportunity of a tactic (see move 13), John found a discovered attack which could have led to recapturing his lost pawn. 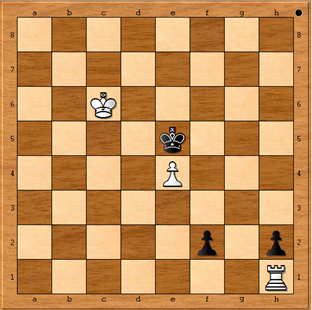 Instead of recapturing the pawn (see move 14), John decided to push his pawn instead. Leading to more positional play the game looked decidedly drawish as they shook hands. One and a half up, and it looked like this captaincy was pretty easy! When I looked over to board 3 I got to see Matteo deliver a lovely check with his Queen that gave him a rook for free. His opponent smiled gracefully, “well played”, and they shook hands. Although the early positional plays are unclear to me (my weak point, I know), the tactical finish was beautiful! Matteo gave me a win, smiled, and disappeared in the blink of the eye. Well played sir, and thank you for turning out. 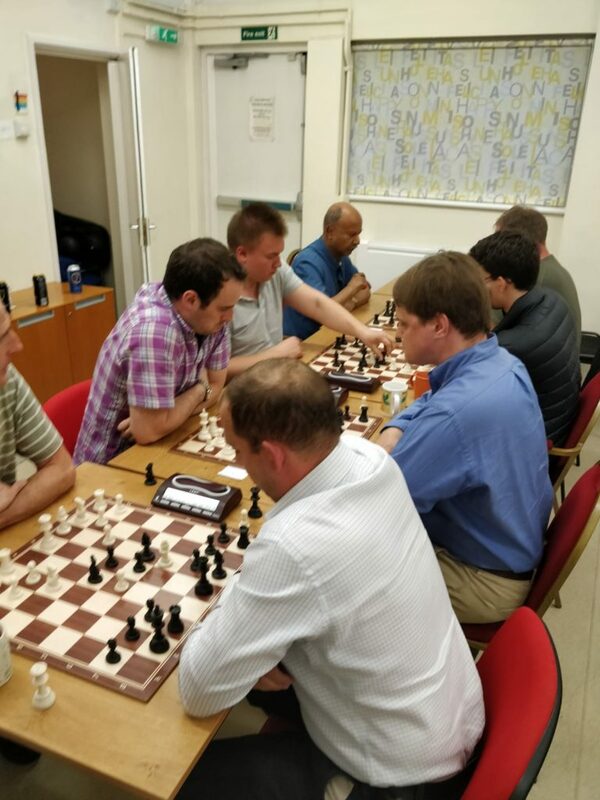 Thank you to all of you for playing, and anyone else who is interested in playing some Summer League chess for the U150’s section please drop me an email: charliesturt2000@yahoo.co.uk, and I will try my best to fit you in. So I was in no mood to take the draw offered on move 39, but to be honest I was in a terrible position, so who knows what goes through my head sometimes!! However, just like Jeremy I too voted “to leave” and although it seems to some that we may have put ourselves in a worse position (see move 41), maybe like Harry, Europe will also blunder (see move 43) and we will come out stronger for it. Continuing the excellent web-form of last season, the Summer League is again putting every game online each week for your perusal and enjoyment! Ladies & Gents, the Summer League is almost upon us! It all kicks off next Tuesday evening from 7pm at Battersea’s home venue – The Battersea Labour Club, down on Falcon Road, a mere 5 minute stroll from Clapham Junction station. 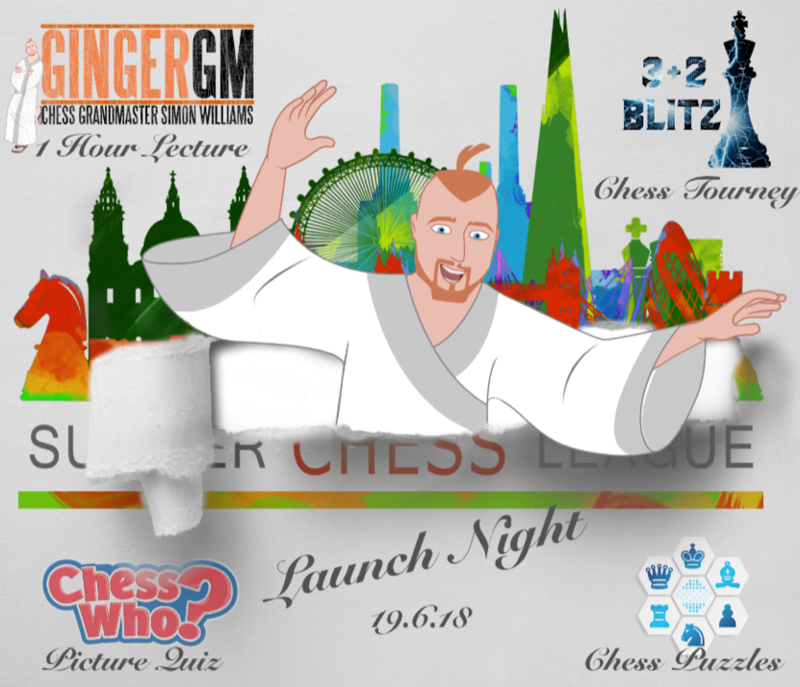 Remember, the Summer League is a bit different from the usual staid and sometimes stuffy atmosphere of most league chess, and the launch night will be no different – it’s going to be a chess extravaganza! With fully 26 teams this year (yes, twenty-six – that’s not a typo!! 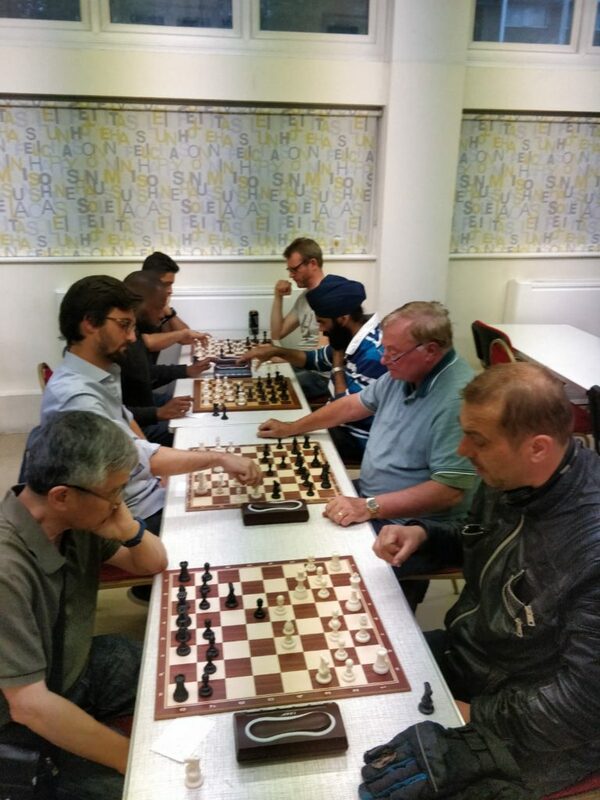 ), Summer Chess has gone London-wide, with entries from all over the city. First up, GM Simon “The Ginger GM” Williams, will be providing one of his entertaining & equally insightful lectures for the audience. This will be followed by a blitz tournament, a Chess-themed quiz, and a series of puzzles. It’s going to be massive! Sign up to ensure you don’t miss out – it’s going to be a great evening! 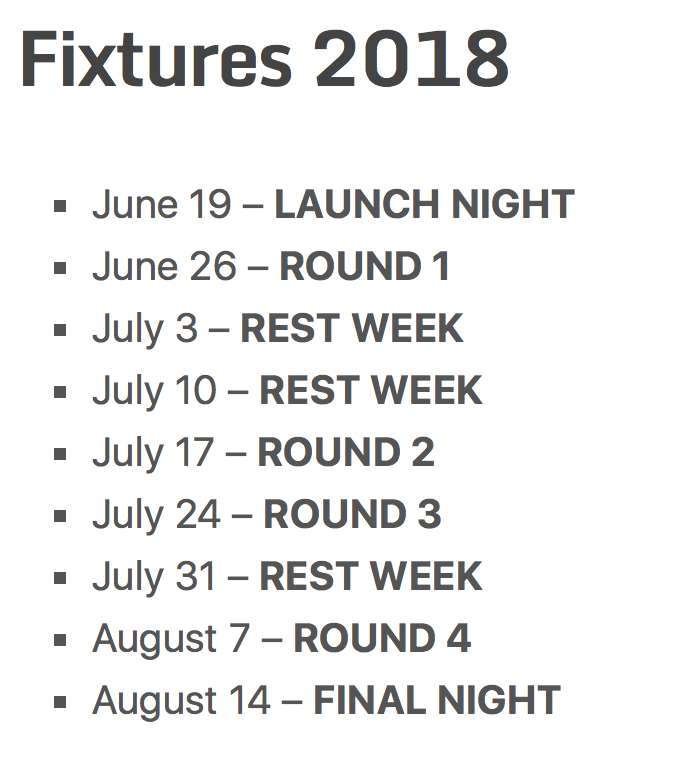 And remember, the rest of the game nights are as follows – your captain should already have been in touch to check availability. If not, just drop us a line! 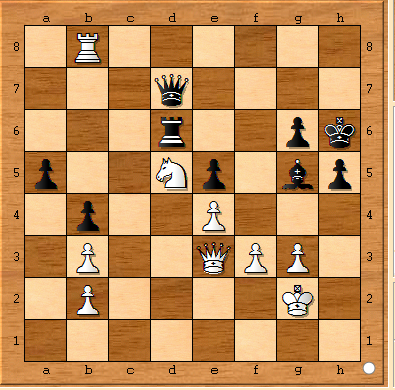 So last week’s offering was a bit of a thronker-of-an-endgame study, with White in a seemingly precarious position. Black was threatening promotion, and despite being a Rook to the good, White appears to have very few options – how to force the draw. Cometh the hour, cometh the man… and our local Twitter celeb and top player, Jim stepped up with the winning moves. Congratulations Jim! Black, an all-time great, has just played Bg5? How was that brutally punished? Answers in the comments please. The club’s top players will be hosting a total of SIX training sessions throughout the Summer. Specific details will be announced nearer the time, but we already have some great things scheduled. ECF-accredited coach, Paul McKeown, will host a pair of sessions (9th July & 30th July) focused on “Calculation and visualization with Michael Tal” – each session aimed at different strength players, though as with all our events, everybody is welcome. Two of our strongest players – Jim Stevenson, and Carsten Pedersen – will be taking a session each. Jim will be focusing on “Practical Thinking Skills” (25th June), using illustrations from classic Bobby Fischer games. Meanwhile, Carsten will be providing his expert analysis on some games submitted by members (23rd July) – you’re invited to submit 3 or 4 games each, at least one win and one loss, and Carsten will take us through some of the more instructive ones. And another ECF-accredited coach, Tony Niccoli, will be taking a session on 20th August. Details TBC at the moment, but those who came to Tony’s session earlier in the season will recall what a well-run and instructive evening that was. As well as the training, Carsten will be providing us with a fascinating lecture on the History of Chess, for general interest on 13th August. Team Rapidplay (2nd July) – attendees will be split into four teams and play one rapidplay game against each of the others. Prizes to the winning team! Some of last years tournament winners, with prizes!! Arguably the highlight of Summer 2017 – this year’s Kensington pub crawl will incorporate even more pubs, with plenty of chess along the way. Save the date – 6th August! The powers that be have selfishly littered a few Monday nights with big football games and bank holidays. No problem! Come along to The Albion anyway and there’s sure to be plenty of like-minded folks around to play some chess. 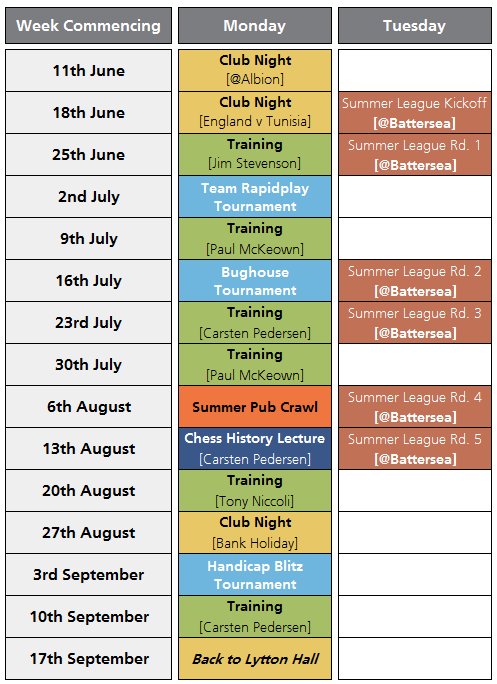 And don’t forget – as well as all this, there are also 6 Tuesday evenings of Summer League Chess down at Battersea Chess Club (5 mins from Clapham Junction). We are entering even more teams this year, so there’ll be loads of competitive chess to play! Stop the Press!! Hold the Front Page!!! After the shortest AGM in Hammer history, the hammerites got down to the fun part of the evening – the final leg of our three-tourney-cycle to determine the Handicap Blitz Champion of the Club for the 2017-18 season. 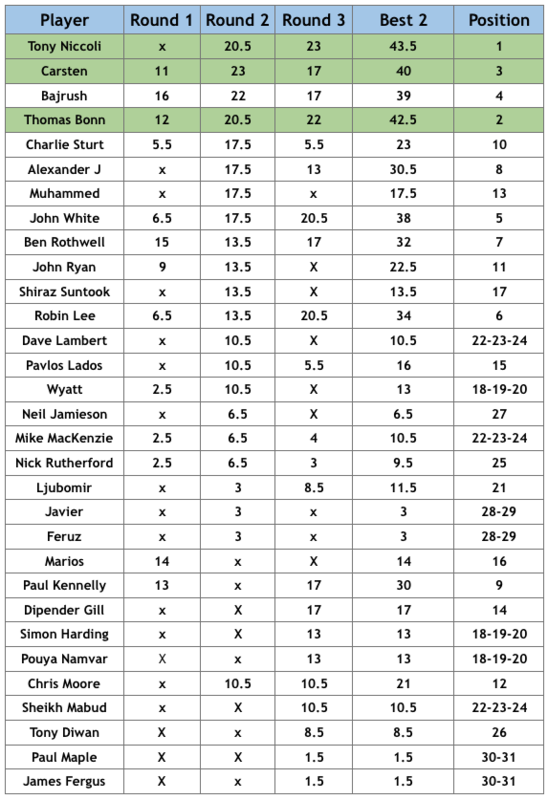 Twenty-three of the best of our club entered this final round with the two blitz gurus of the club, Chairman Bajrush, and Carsten, vying for top dog status. They were #1 and #2 in the rankings after the first two rounds and surely one of them would emerge as the champion? However, matters were not so simple, with 23 points up for grabs for first place in this final round. Without further ado I can announce that the winner of the third-round of the Blitz Tourney with a perfect 8/8 was Tony Niccoli. Not only that, but he also seized the overall title as well with this superhuman performance that propelled him into first place. A stunning score of 43.5 points. 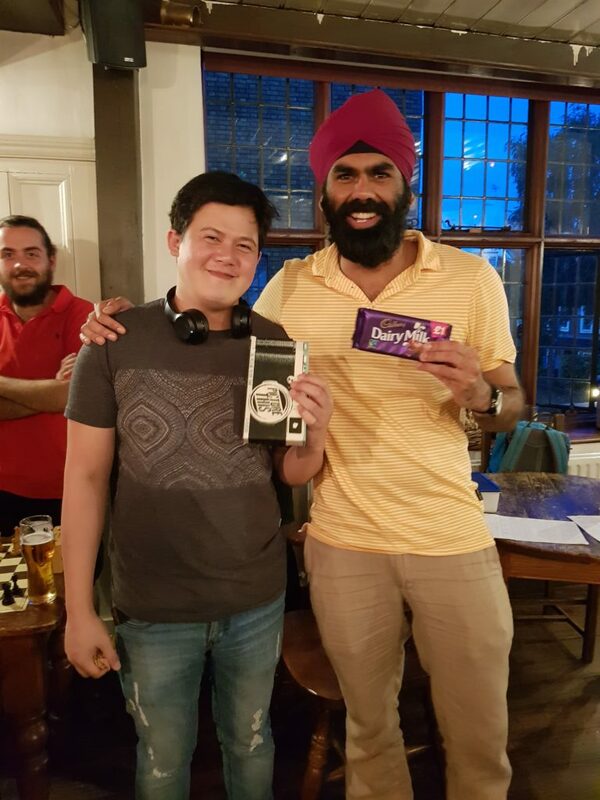 In second place was new member Thomas, with a total of 42.5 points – another epic performance. In third and fourth respectively were bookies favourites, Carsten and Bajrush. The best result of the night was Robin Lee, who finished joint 5th despite being ranked 15th – a really stellar performance. A big vote of thanks must go to Adam who ran the tournament really well and used the software expertly to keep matters rolling along. So, we have a new champion – yet another sign of all the changes happening in our vibrant club – roll on next season! The best is yet to come. Author HammerPosted on June 6, 2018 Categories Club Updates, Games, General Chess, Tournaments1 Comment on Stop the Press!! Hold the Front Page!!! Puzzle of the Week #018… plus FREE GM Simul! It has officially been one month since our previous Puzzle of the “Week”, so without further ado, the winner from our previous Puzzle is…. Charlie (aka. Sorted) & Adam (aka. Pickle), both of whom were correct, albeit with ever-so-slightly different styles of responding! Honours shared this time – congrats to both excellent solutions. The puzzle was taken from Sokolov-Thogersen, Rilton Cup 2018. White should now have continued with Rxb7 with reasonable drawing chances but Sokolov played Bxa7 and eventually lost, securing his opponent a well deserved FM title. The position was from the weekly column in the Danish newspaper Fyens Stiftidende, a personal tribute to their long standing chess correspondent Niels Erik Neilsen, who is recovering from a recent stroke. Our puzzle-setter in chief, Carsten, has known Niels Erik for almost 40 years, so I’m sure we all join Carsten in collectively sending Niels Erik our best wishes too! If that’s not enough for you, our friends over at Battersea Chess Club will be hosting GM Danny Gormally for a Simultaneous exhibition next week – and it’s FREE to enter! Who? GM Danny Gormally, currently rated 2484! Battersea have generously reserved a number of spots just for us Hammers, so you’ll be guaranteed a place – you just need to drop Aldo an email to confirm first. Author HammerPosted on June 1, 2018 June 1, 2018 Categories Club Updates, General Chess, Training & Theory7 Comments on Puzzle of the Week #018… plus FREE GM Simul!